It is the aftermath of the massacre at Sandy Hook Elementary School in Newtown, Connecticut, where a young man, Adam Lanza, who was apparently emotionally disturbed murdered at least 20 children and several adults. Nothing anyone can say will ease the pain of those families. But we do need to discuss another issue that always comes up - usually very briefly - at moments like this. That issue is gun regulation. February 22, 2012—Five people were killed ... at a Korean health spa in Norcross, Georgia, when a man got into an argument and opened fire inside the facility. February 26, 2012—Multiple gunmen began firing into a nightclub crow[d] in Jackson, Tennessee, killing one person and injuring 20 others. Sixteen fatal mass shootings in 12 months. That averages to one such incident every three weeks. If we consider that rare, it is a cynical comment on our society. Should we start worrying about the easy availability of guns in this country? No, say the advocates, “Guns don’t kill people. People kill people.” Let’s immediately dispense with this distracting piece of gibberish. Perhaps guns don’t kill people unless other people are shooting those guns, but that is hardly relevant. Without a gun, you do not easily kill 26 people in 10 minutes. One hears many simple dismissals of guns at at time like this. Here’s another: the problem is not guns, it’s video games! While there can be no doubt whatsoever that video games are a toxic influence, nobody ever killed anyone with a video game. At this writing, answers are lacking to most of our questions. Why did he do it? Why pick that school? No one can say. But we do know the answer to one question: Where did this young man learn to shoot so accurately? He learned from his mother! The guns he used belonged to her. She taught him how to aim and fire them. Target shooting was a family sport. These were combat-grade weapons. And she owned them legally! 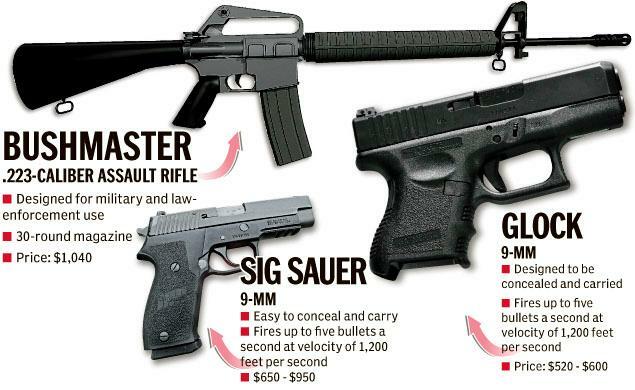 Latest reports indicate that the actual murder weapon was the assault rifle, “designed for military and law-enforcement use” (see figure). It was a semiautomatic, similar to what soldiers in Afghanistan use. Mom needed this military-grade weapon in her home for target practice? The audacity of the gun lobby is that they do not want curbs or limits on anything. The assault weapons ban expired in 2004, under Republican President Bush. It had no chance of renewal. Yet were it still in effect, chances are young Lanza would not have found it so easy to just pick one up and bring it to school. Gun lobbyists, however, refuse to accept the obvious. They claim that you can’t keep guns from people who will use them badly, that they will always find a gun somewhere. That’s the basis for their argument that gun control laws don’t work. But one cannot say that gun control would not actually work because we have never had real gun control in this country. With this country’s patchwork of crazy laws, one state’s strict regulations are easily circumvented by another state’s permissiveness. A huge number of gun crimes committed in New York have been traced to guns purchased in Virginia. (3) And the easy, virtually unrestricted access to guns that we have now certainly makes impulse crimes far more likely. “What about the Second Amendment?” gun advocates always ask. “It’s in the Bill of Rights.” The Second Amendment gives every citizen the right to bear arms. How many times we keep hearing that. What we usually don’t hear is the first part of the amendment: “A well-regulated Militia, being necessary to the security of a free State.” The historical context of the Second Amendment was this fledgling country’s fear of standing armies. Today this is an anachronism. Think of what would happen if we armed the general population with weapons similar to those our armed forces use, to ensure that our country’s military will not seize power and deprive us of our freedoms. In any case, there is nothing “well regulated” in making firearms available to common criminals and disturbed individuals without any meaningful safeguards. If Nancy Lanza had not been exercising her Second Amendment rights, her son would not have had such easy access to weapons with such destructive power. “But,” we are told, “people need those weapons for self-defense. People need to protect themselves. If everyone had a gun or even a semi-automatic combat rifle, somebody could have stopped the massacre.” Not likely. It is very hard to defend against the element of surprise. More guns in the hands of more people, especially people with no law enforcement training, will surely result in more lives lost in crossfires. Even highly trained police officers not infrequently hurt innocent bystanders. Think of the chaos that would result with untrained or semi-trained gun owners jumping into the fray from all directions. Do we really think that bringing back the Wild West will promote public safety? I am not proposing a ban on all gun ownership. There are some cases in which it might make sense. For example, shopkeepers in rough neighborhoods who have suffered many holdups may sensibly own a gun, if it is licensed and carefully regulated, and if the users pass a rigorous training program, and if they do not carry the gun around with them every place they feel like it. The purpose and use of these weapons should be strictly circumscribed. These should also be considered special cases. The idea that the solution to gun violence in this country is even more guns in the hands of even more people in every public place really is as ridiculous as it sounds. We are at the mercy of the hypocrisy of a political party that promotes policies enabling mass death, yet calls itself “pro-life.” Those who support these policies have succeeded in intimidating the rest of us. It is time we cut through the slogans and the deception and the name-calling and insisted on a reflective consideration of policies tied to so many national tragedies. If 20 dead children will not force a rational discussion of gun control in this country, then nothing will. And I am afraid that nothing will. (1) Halimah Abdullah, “Obama Remains Committed to Assault Weapons Ban, White House Says,” CNN.com, December 16, 2012. (2) From George Zornick, “Sixteen US Mass Shootings Happened in 2012, Leaving at Least 88 Dead,” The Nation, December 14, 2012. (3) Jim Hoffer, “Gun Show Loophole in Virginia,” WABC, December 13, 2010. (4) Eric Nagourney, “Consequences: Gun Ownership Linked to Higher Homicide Rates,” New York Times, January 23, 2007. (5) Eric Nagourney, “At Risk: Availability of Guns Raises Suicide Rates, Study Finds,” New York Times, April 17, 2007. (6) David Frum, “American Fantasies That Lead to Massacre,” Sunday Times of London, December 16, 2012. (7) E.J. Dionne Jr., “Our Gag Rule on Gun Control,” Washington Post, July 23, 2012.